Randy G. Mowder, of Rock Island, passed into heaven June 12, 2017, with his loving wife and family by his side. Memorial services will be held at noon Tuesday at Grace Bible Church, Moline. Visitation will be from 11 a.m. until the start of services. Burial will follow at the Rock Island National Cemetery, Arsenal Island. In lieu of flowers, memorials may be made to Grace Food Pantry or the family. Quad Cities Cremation Center is assisting the family. Randy was born Dec. 15, 1950, in Moline, the son of George and Margaret Six Oliver Mowder. 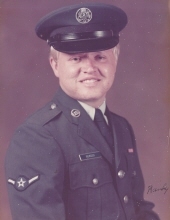 Randy served as a sergeant in the United States Air Force from 1973 to 1976. Later, he joined the workforce for Menards as an estimator. On June 7, 1980, he was united in marriage to Jackie Dickerson in Rock Island. Randy loved God, church and family. He enjoyed playing pool and spending time with his family. Those left to cherish his memory are his wife, Jackie Mowder, Rock Island; son, Joseph (Amanda) Mowder, Oquawka; grandchildren, Ryan (Samantha) Mowder, Brett Mowder, CJ Cassiday and Khloey Mooney; great-granddaughter, Rileigh Mowder; and sisters, Sandy Emtree and Eileen Robinson. To plant a tree in memory of Randy G Mowder, please visit our Tribute Store. "Email Address" would like to share the life celebration of Randy G Mowder. Click on the "link" to go to share a favorite memory or leave a condolence message for the family.